Preview is a program that is supplied with OSX and functions as a Graphics, Fax, and PDF viewer. Several new features have been added to the version supplied in OS X 10.5. I won't cover all of them in this tip. What I will cover the power to manipulate PDF files using the sidebar. These features are not in the Preview help files. In MacOSXhints there have been several articles on these hints. 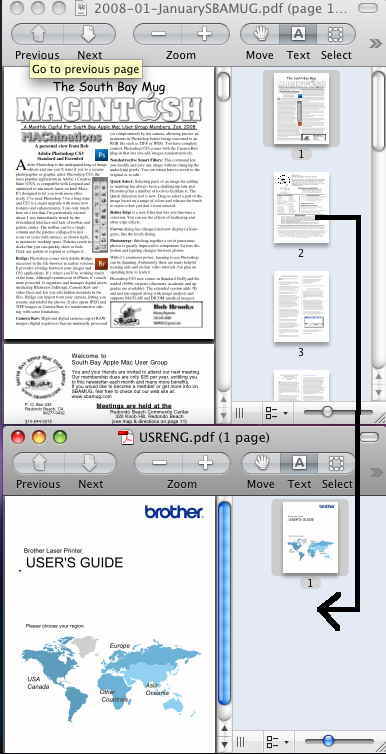 In previous versions of Preview ( OS X 10.2, 10.3, and 10.4 ) there was a sidebar that displayed thumbnails of multipage PDF's, Tiff files, or multiple image files. This allowed for quick navigation to a particular page or image. This functionality is maintained in the new version. The sidebar is on the right as you can see. Click on the thumbnail and drag it to were you want it. In the example screenshot above, you would say click on page 5. Drag it between pages 1 and 2. A red line will appear between pages 1 and 2. Release the mouse. Page 5 is now located after page 1 and before the former page 2. Then do a SAVE or a SAVE AS as required to save the new re-ordered PDF file. 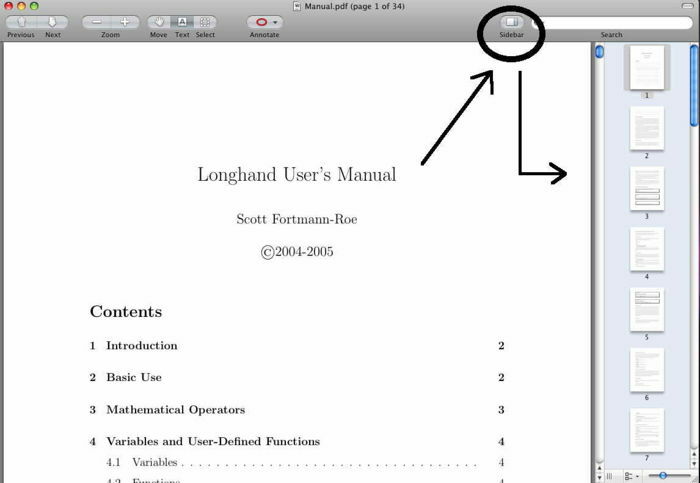 If you drag a PDF file onto the sidebar it will be combined with the PDF file you have open in PREVIEW. The order again is where you place it. If you drag an image file onto the sidebar, that image will be placed on its own PDF page. Once again the order is in where you place it in the sidebar. Then do a SAVE or a SAVE AS as required to save the new combined PDF file. There may be a limitation on the types of image files that can be added. Also if you drag a multi-page PDF file over, the entire multi-page PDF file is moved over and combined. In the example above I'm showing dragging Page 2 and just page 2 of the January newsletter to the page after page 1 of the USRENG PDF file. I would then save the USRENG file or save as an alternate name. The preview version in 10.6 has changed the way that PDF's are combined. You must drag the PDF page on top of another page in the sidebar to combine them. The page will take on a spiral comb look on the left edge. You can still do a page re-order after combining the files. This page was last modified on 31 December 2009, at 16:27.